Prep Time: 20 min. | Cook Time: 40 min. 2. Pierce surface of meat with a fork and place in a resealable plastic bag with pureed mango, balsamic vinegar, oil, salt and pepper. 3. Seal bag and marinate in the refrigerator for several hours or overnight. 4. Combine all chutney ingredients in a medium saucepan and stir well. Bring to a boil; reduce heat and simmer, covered, for 20 minutes. 6. When ready to serve, remove chicken from marinade and grill over medium coals for about 5 to 7 minutes on each side minutes, or until cooked through. 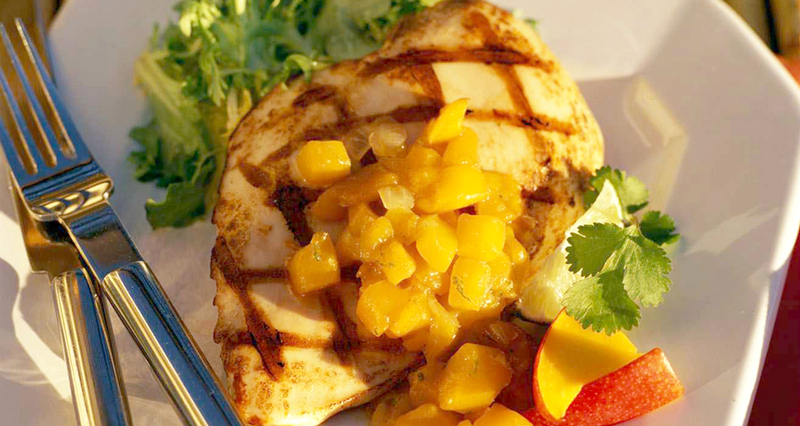 Serve with Mango Chutney.